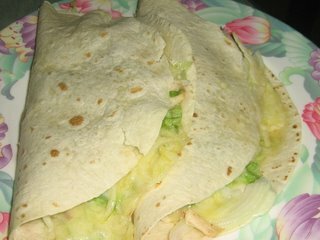 For Sunday's lunch, since there were leftover roasted chicken - mainly the breasts, from Saturday's "lunner", I thought hey why not make Chicken Wrap. I had all the ingredients needed except for tomatoes to make the Chicken Wrap. Here it is the pic and recipe. Spread some mayonnaise on the bread. Fill with chicken, onions and lots of lettuce. Then sprinkle some mazorella cheese. Fold the bread into 2 and toast it on a pan or put it in a preheated oven till the cheese melts. Serve drizzled with chilli sauce. I also made a dessert for Sunday's lunch which I will share tomorrow. Check out this space again yah!